One of the big kitchen design trends we are seeing on Pinterest, Instagram and Houzz are kitchen cabinets with two different paint colors. The trend is a darker color on the bottom cabinets with a creamy white on the top cabinets. We love this one from one of our favorite kitchen designers, Studio McGee. Two-toned kitchen by McGee and Co. They used a matte black for the bottom cabinets and a creamy white for the top cabinets. Our current favorite version of this trend is navy blue on the bottom. Like this kitchen we just completed. This was a perfectly beautiful kitchen before with classic white painted cabinets. But the new homeowners, a young, hip, professional couple wanted to infuse some of their personality and style into the kitchen. 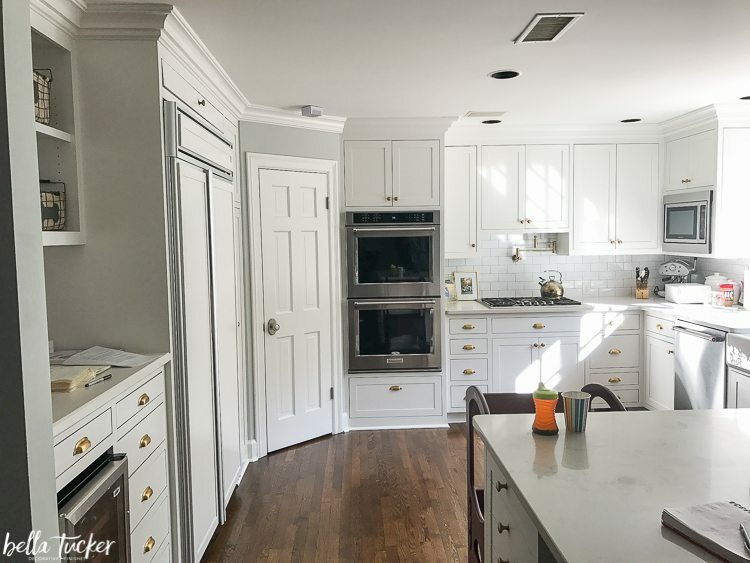 They selected Benjamin Moore- 2135-30 Nocturnal Gray for the bottom cabinets and Benjamin Moore OC-117 Simply White for the top cabinets. Blue lowers and white upper cabinets. This works in this kitchen because the beautiful white Calcutta Grey Quartz countertops and the simple white subway tile create a white color block vertical transition into the white upper cabinets. Blue and white cabinets done right with white quartz and white subway tile. The brass hardware pairs perfectly with the navy blue. Nocturnal Gray paint by Benjamin Moore paired with brass hardware. 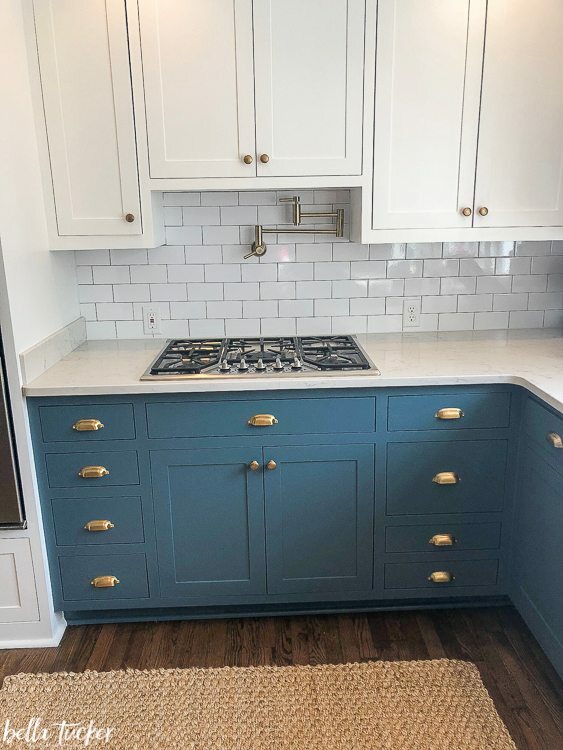 When choosing just the right navy paint color you will need to look at a large painted sample board in your kitchen and consider your lighting, your countertops, backsplash and flooring. You want to make sure the navy doesn’t look purple or black. Here is kitchen we just finished with an island painted in Sherwin Williams 6244 Naval. Island painted in SW Naval. I’ll be sharing much more of this dramatic kitchen makeover soon. It is so, so, so good. And here are a couple more before and afters of the two-toned kitchen. We would love to help you with your kitchen re-design project. 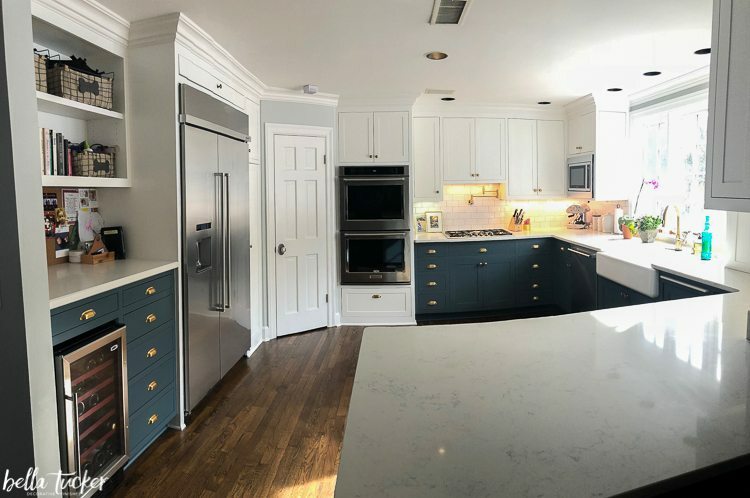 After transforming 100’s of kitchens in the Nashville area we have honed amazing, beautiful, money saving ideas to get the biggest impact for your budget. From stand alone kitchen cabinet painting to full service project management and design- we’d love to help. Just fill out the form below to get started with a free on-line estimate.